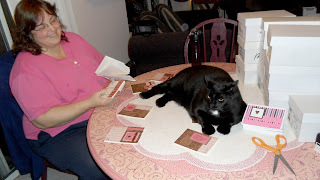 A few little pictures....cardmaker Lori came over to Sandy's to help pack cards! The first shot is a full shelf system! 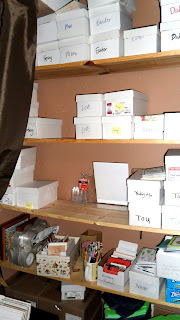 The middle two shelves are current cards—birthday, thinking of you/general, love, and Valentines. Cards with hearts but without "Happy Valentines Day" on them were sorted into the "love" boxes—they'll have a longer shelf life for our heroes, and we want to be sure the Valentines get in their hands asap. Separating the general love from Valentines assures we can focus on getting the holiday cards mailed out first. The top shelf is upcoming holidays, with cards saved from shipments all year long. The bottom shelf has past themes (fall, Halloween, TG, Christmas) as well as the oversized cards that are harder to pack into the boxes. This "during" shot is our kitty mascot Tsuki (short for Tsukineko!) trying to steal the show....she totally plopped herself in the middle of everything! Lori gave her the eye, but it took a little more than that to get her highness to move to make room for sorting out all those lovely valentines! And finally, 8 finished boxes! 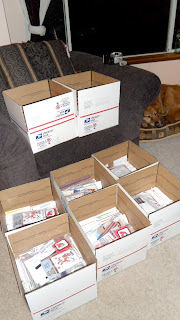 Each contains 75 valentines, 75 love cards, 75 thinking-of-you cards, 60 birthday, and 15 thank-you cards, plus a baggie of hero mail! We had a great time reading the letters from kids before they went into the bags—kids are a treasure! 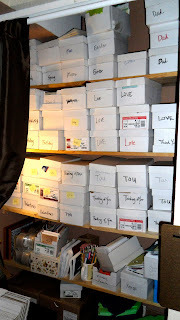 The shelves still have 4 boxes full of Valentines left (below); several cardmakers sent in so many multiples (hundreds!) of a single design, it's taking a while to get them into boxes. We make every effort to put a wide variety of cards into each box, so typically no more than 4 of one design ends up in any given box. But it sounds like enough cards are still in the mail that the rest of the Valentines may be able to mix into a few more boxes next week! Thanks for the photos and the update!! It's great to see how you guys coordinate all the cards you get and then get them shipped out. All the shippers are awesome and we thank you for your time!!! You work so hard! I've got a box of almost a hundred valentines and love cards on its way to you... I hope it gets there in time for them to be of use! Sandy, this is a terrific entry. Very helpful to the new shipper!